Bee sting, Kounis syndrome, Myocardial infarction. First report of acute myocardial infarction during a prolonged allergic reaction to penicillin was published in in the American Heart Journal in 1950 . Kounis Syndrome was firstly described in 1991. It is also known as “allergic angina syndrome” or “allergic myocardial infarction . Furthermore, the association of allergic reactions and acute coronary syndromes called KS has called acceptance as a new cause of coronary artery spasm . There are a lot of causes such as drugs, a number of conditions, and a variety of environmental exposures that have been reported as capable of inducing Kounis syndrome . In this case, we describe a patient with Kounis syndrome who were admitted to the hospital after bee sting with acute-onset chest pain and dyspnea, accompanied by allergic symptoms, electrocardiographic changes. A 48 y old man was stung by only one honeybee from neck region in the picnic; fifteen minutes later erythematous rash and dyspnea developed accompanied by breathing difficulties and impaired consciousness (Figure 1). Therefore he called ambulance. He has not previous history of allergy, bronchial asthma, dermatitis, diabetes or coronary artery disease. Dyspnea and erythematous rash gradually increased in ambulance and chest pain added to these symptoms. Because of the palpitations, hypotension, and bradycardia, Electrocardiogram (ECG) was taken from the defibrillator. ST elevation was seen in the inferior derivation (Figure 2A). In ambulance only adrenalin, anti-histaminic and cortisol were administered. When he came to the hospital, his chest pain and hypotension were continued. Therefore, 12-derivate ECG demonstrated inferior ST elevation (Figure 2B). Figure 1: Honeybee sting on the neck region. 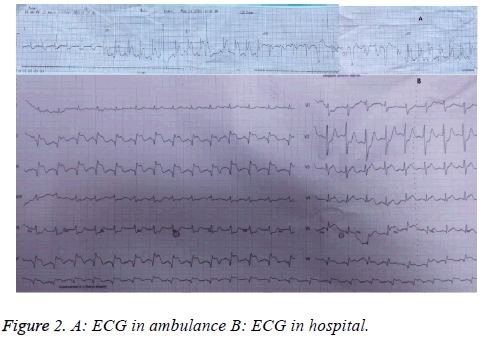 Figure 2: A: ECG in ambulance B: ECG in hospital. Adrenalin was administered again. Then echocardiographic examination was performed. Any wall-motion abnormality was not seen. Furthermore, coronary angiography was performed and we detected normal coronary arteries (Figures 3A-3C). Figure 3:A-C: The image of normal coronary arteries D: ECG after the coronary angiography.. Blood samples were taken for cardiac enzymes, troponins before the coronary angiography. We found that troponins with 1.8 mg/ml and Creatine Phosphokinase (CPK) with 487 ng/ml and CPK MB: 120. The ECG had no ischemia and ST elevation after coronary angiography (Figure 3D). The patient was diagnosed as Kounis syndrome and discharged after 3 d hospitalization. We reported a case of 48 y old man presented to acute inferior myocardial infarction after bee sting. When we found normal coronary arteries we thought that the patient was Kounis syndrome. Furthermore, Kounis syndrome is characterized by acute coronary syndrome with mast cell degranulation during allergic reaction . Following mast cell degranulation several mediator release such as histamine, neutral proteases (tryptase, chymase), platelet activating factor and newly synthesized mediators such as an array of cytokines and chemokines and others by the metabolism of arachidonic acid through activation of a phospholipase [4,5]. Both of them cause vasoconstricting. Especially tryptase level is important at the acute allergic reaction because tryptase has a role to inducecoronary artery spasm and/or plaque erosion or rupture [3,5]. Tryptase has a half-life of 90 min. If we are sure Kounis syndrome in our case we may administer medication and observe the case. But acute myocardial infarction has a high mortality so we did not wait. In conclusion Kounis syndrome is a rare cause of an acute coronary syndrome with atypical presentations. Furthermore, diagnosis process could be delayed with the insufficient knowledge. Pfister CW, Plice SG. Acute myocardial infarction during a prolonged allergic reaction to penicillin. Am Heart J 1950; 40: 945-947. Kounis NG, Zavras GM. Histamine-induced coronary artery spasm: The concept of allergic angina. Br J Clin Pract 1991; 45: 121-128. Kounis NG. Kounis syndrome allergic angina and allergic myocardial infarction: a natural paradigm? Int J Cardiol 2006; 110: 7-14. Nikolaidis LA, Kounis NG, Grandman AH. Allergic angina and allergic myocardial infarction: a new twist on an old syndrome. Can J Cardiol 2002; 18: 508-511. Galli SJ, Nakae S, Tsai M. Mast cells in the development of adaptive immune responses. Nat Immunol 2005; 6: 135-142.